At 1021, light smokes were observed just below the West Ridge in the Cache Bar drainage where the fire had crossed the ridgeline the day before. Between 1030 and 1100, the fire was becoming active below H-1. At 1130, the first weather observations were taken on the fire near H-1 at 4,300 feet: 84 °F, 12-percent RH, winds from the east at 3 mph with gusts to 11 to 15 mph. There were some light smokes below the West Ridge above the Cache Bar drainage where the fire had slopped over the day before, but activity there was also minimal. Fire activity began to increase by 1330 as conditions became warmer and drier. The fire reached Cramer Creek to the east, and was active along the east and northeast flanks. Fire spread there was low intensity and backing downhill with 1- to 2-foot flame lengths. Most of the more intense fire activity was just below H-1, with flame lengths from 4 to 6 feet, and increasing in intensity into the early afternoon. The fire started to heat up, roll out, and make short runs in the grass. To the west, the fire had backed further into the Cache Bar drainage in 3- to 4-foot brush (shiny-leaf ceanothus, figure 22) below the West Ridge, seen as smokes and a low-intensity backing fire. As the fire backed through litter and grass underneath the brush, the foliage was dried. 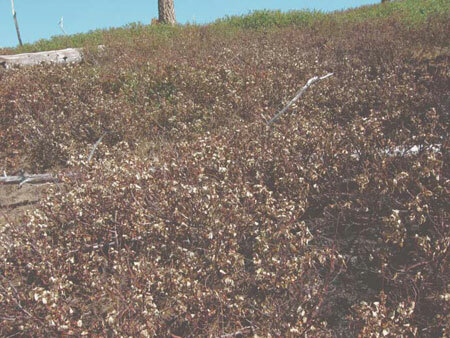 Figure 22—Ceanothus foliage dried by a backing fire (Fountain Creek). The following (table 3) shows temperatures recorded on July 22, 2003 from late morning through midafternoon. Observations shown are from the Indianola and Lodgepole RAWS stations, Long Tom Lookout, and the central Oregon regulars crew on the Cramer Fire, and are listed from higher to lower elevation at the observation site. Table 3—Fire weather forecast comparisons at different elevations. Midpoint between 1100 and 1200 obs. Midpoint between 1200 and 1300 obs. Midpoint between 1300 and 1400 obs. Missing 1500 obs; used midpoint between 1400 and 1500 obs.